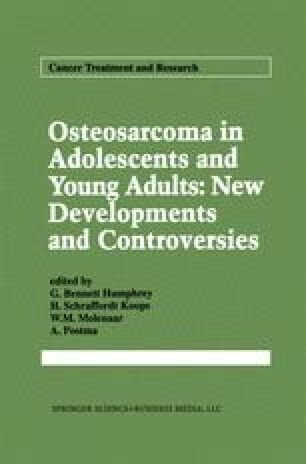 The concept of salvage surgery in osteosarcoma is based on solid knowledge of the natural history of this disease. Unlike many other solid tumors, sarcomas manifest the peculiar characteristic of organ-restricted spread [1,2]. In most cases, lung metastases are the only site of distant relapse, occurring in 50–80% of osteosarcomas [1,3]. Although, if the cure rates for childhood osteosarcoma have dramatically improved over the last 20 years, lung metastases still remain a major cause of failure, occurring in 40–50% of patients  and being refractory to salvage chemotherapy [5, 6, 7]. A summary of the reported results of salvage surgery in osteosarcoma is given in Table 30-1 [8, 9, 10, 11, 12, 13, 14, 15].